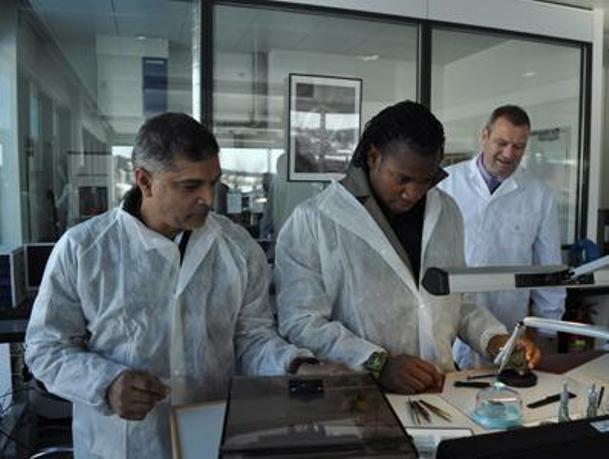 Jamaican speed met Swiss precision when World Champion sprinter Yohan Blake, 100 metres silver medallist at the 2012 Olympic Games, visited the Richard Mille manufacture on Wednesday last, just after the Salon International de la Haute Horlogerie in Geneva, which opened on Monday 21st January. The sprinter, known as ‘The Beast,’ was keen to immerse himself in the atmosphere of this temple devoted to fine watchmaking. Accompanied by his personal staff, Yohan set off to meet Richard Mille’s team of watchmakers in the Swiss Canton of Jura. He was introduced to manufacturing director, Yves Mathys, who showed him around the production facilities. Yohan then signed several pairs of sprint shoes after the tour. Of course this was not the first time that the 23-year-old Jamaican has been to Switzerland. It’s in Lausanne on August 23rd 2012, that Johan became the third greatest sprinter of all time by winning his 100 m race in 9.69 seconds. Johan made world headlines by beating his personal best by six-hundredths of a second, as well as confirming his potential to smash records. 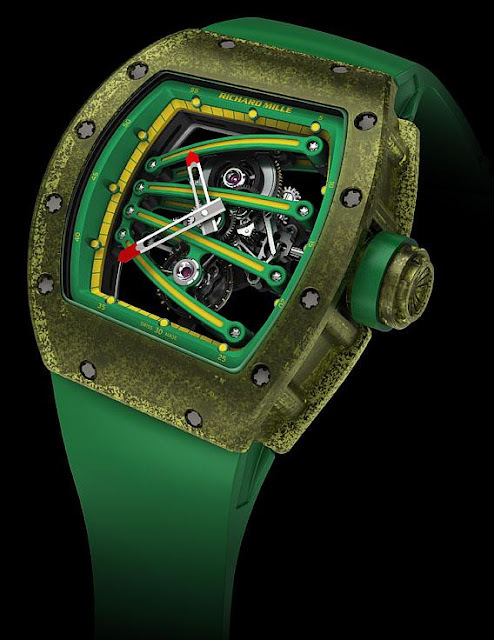 His new Richard Mille watch, which debuted at SIHH, is hitting the headlines as well. Called the Richard Mille RM59-01 Yohan Blake Tourbillon, it’s specially designed for the sprinter to be worn while actually sprinting. The strident green strapped watch is made of a translucent composite, injected with carbon nanotubes. It is both ultra-light and ultra-strong. And as with all RM pieces, this piece is filled with all kinds of high-tech materials and technology. The watch is an impressive 50.24mm x 42.7mm x 15.84 mm. The bridges on the watch are designed to resemble the claws of ‘The Beast’. Limited to just 50 pieces it’s going to be a sprint for wealthy playboys to get hold of one of these very rare watches.